From a publishing perspective, much of the Victorian era and the Edwardian one which followed was taken up with the issue of copyright and efforts to defeat music pirates. Part of the problem was how the law treated music copyright infringement – the only remedy was for the copyright owner to seize the illegal copies. Another part of the problem was the seemingly insatiable demand for cheap music, probably led by the increase in piano ownership, which the pirates sought to satisfy. Although the problem affected composers of all genres, it was perhaps the ballad composers who suffered most. Music Hall was experiencing the peak of its popularity by the end of the 19th century and was popularising new songs on a regular basis, which the pirates could make available for twopence a copy. The quality was not comparable with the legal four shilling version, but the public simply wanted access to a lot of music at home. The work of the pirates was assisted by the availability of older printing presses made redundant by advances in print technology. The Copyright Act of 1902 proved to be of little relief, and in 1903 Francis, Day & Hunter announced that if a first edition of a popular song priced at two shillings sold sufficiently well, they would later issue a sixpenny edition. Chappell & Co, who led the fight against the pirates, thought there would be little take up of this scheme by other publishers. 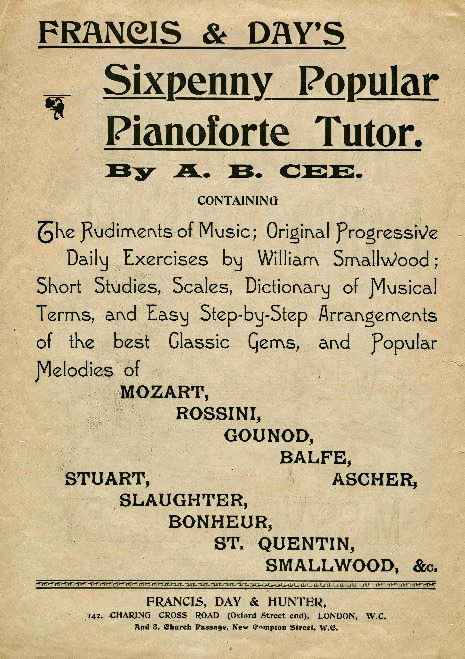 By early 1905 it was reported that the sixpenny edition was becoming the norm and that music at two or three pence a copy was being sold by non-music specialist traders. Music publishing was not Cassell’s main sphere of interest, but by pricing the Musical Home Journal at one penny for a weekly magazine of four to six pieces of music, they were clearly following a market trend. The Copyright Act of 1906 provided penalties of six or twelve months or more of hard labour and effectively killed the pirate trade. The enterprising fraudster instead turned to deceptions such as using the name of a well-known piece to sell music which turned out to be an inferior companion to the named one. The advent of the photocopier and more recently digital reproduction, shows that the pirate problem continually resurfaces according to the technology available.